After market close on 29 November 2017 FTSE Russell confirmed the following changes to the FTSE 100 and FTSE 250 indices. The changes will be implemented at the close Friday, 15 December 2017 and take effect from the start of trading on Monday, 18 December 2017. The following table lists the four FTSE 350 shares that have the best returns in June over the last ten years. For example, Halma has an average return of 6.1% for the month of June. Each stock has risen in June in nine of the past ten years, while Synergy Health is the only FTSE 350 stock to have risen in June for all last ten years. The following table lists the four FTSE 350 shares that have the worst returns in June over the last ten years. For example, Barclays has an average return of -6.5% for the month of June. All four stocks have fallen in June in at least nine of the past yen years. An equally-weighted portfolio of the above strong June stocks would have out-performed every year an equally-weighted portfolio of the above weak June stocks by an average of 11.0 percentage points in June for the past ten years. Since 1970 there are only three months in which the stock market has experienced on average negative returns: May, June and September. In the month of June the average return has been -0.9%. So, historically, this is not a good season for investors. The weak month of May is followed by the weakest month of the year – June. 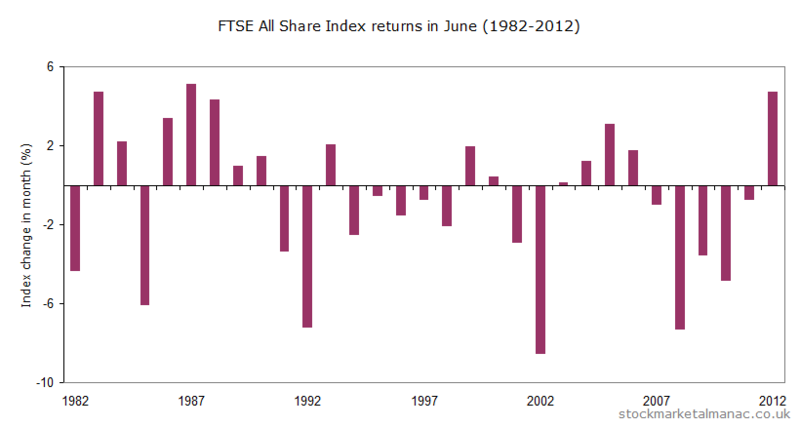 The accompanying chart plots the percentage performance of the FTSE All Share Index for each June since 1982. For example, last year in 2012 the market rose 4.7% in June. But, as can be seen on the chart, that rise was against the trend, the market has only risen that one June in the past six years. And the market falls in June can be quite large; the market has fallen over 3% in June in eight years since 1982. In an average June the market starts strong, hitting its month high on the second or third trading day, but prices then drift down steadily for the rest of the month. In summary then, not a month to get excited about, which is why many investors decide to stay on the sidelines at this time of the year. Despite the overall weakness of shares in June, some sectors have tended to out-perform the market this month, these include: Pharmaceuticals & Biotechnology, Oil & Gas Producers, and Beverages. At the stock level, two interesting companies are Halma and Synergy Health; these are the only companies in the FTSE 350 Index whose shares have risen every June for the past 10 years. The two worst performing shares in the month have been Rotork and United Utilities, both of which have fallen nine times in the past 10 years. The year’s second quarterly review of the FTSE 100 Index will take place on 12 June. It is difficult to predict the outcome of the review a few weeks beforehand, but just at the moment companies looking possible candidates for ejection are Evraz, Polymetal International, and John Wood Group, to be replaced by Travis Perkins, Persimmon, and Intu Properties. The results of the semi-annual review of the MSCI indices were announced in May, but their implementation date will be on 3 June. Like the FTSE review, this can have a significant impact on the individual shares involved. The MSCI indices may not be as well known as the FTSE indices in the UK, but many fund managers worldwide track them in preference to the FTSE. The second Triple Witching of the year takes place on 21 June. And on the economic front, the MPC will make its interest rate announcement at 12 noon on 6 June. The FOMC will be meeting 18-19 June. Posted in June, Market, News	| Tagged EVR, FTSE All Share, HLMA, INTU, June, month review, POLY, PSN, ROR, SYR, TPK, UU., WG. The following table lists the four FTSE 350 shares that have the best returns in June over the last ten years. For example, Halma has an average return of 7.3% for the month of June. 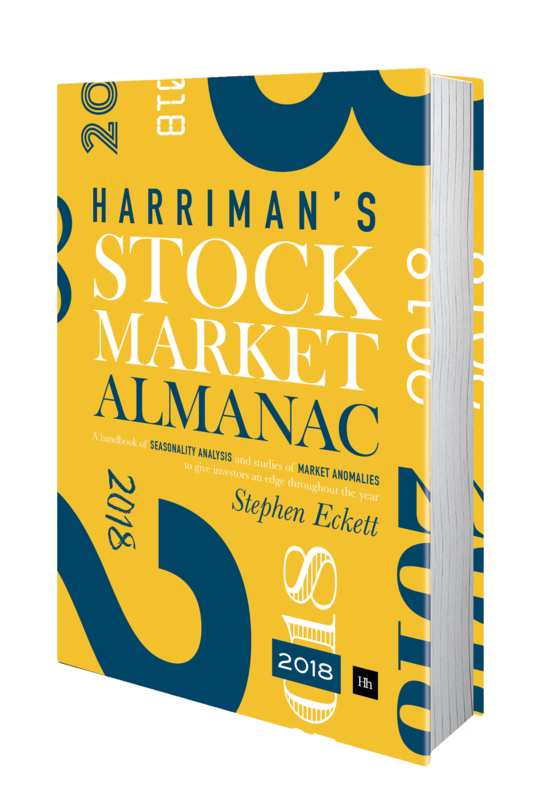 Each stock has risen in at least nine of the past ten years in June – Halma and Synergy are the only two stocks in the FTSE 350 whose shares have risen every June in the past ten years. A portfolio of these four stocks would have out-performed the FTSE 350 Index in June in nine of the last ten years with an average out-performance of 7.9 percentage points each June. The following table lists the five FTSE 350 shares that have the worst returns in June over the last ten years. For example, Land Securities has an average return of -3.6% for the month of June. Each stock has fallen in at least eight of the past ten years in June. A portfolio of these five stocks would have under-performed the FTSE 350 Index in every June over the last ten years with an average under-performance of 3.2 percentage points each June. The 2013 edition of the Almanac looks at the historic monthly performance of the FTSE 350 sectors. Here we look at the Electronic & Electrical Equipment sector. The following chart plots the average out-performance of the FTSE 350 Electronic & Electrical Equipment sector over the FTSE 100 Index by month since 1999. For example, since 1999 on average the Electronic & Electrical Equipment sector has out-performed the FTSE 100 Index by 7.7 percentage points in January. The strongest months are January, April and November – the sector has under-performed the market only twice in the past 13 years in January. The weakest months have been February and September – the sector has out-performed the market only four times in September in the last 14 years.